The US Census reported new factory orders that were lower than expected for July with a 0.8% MoM decrease to $497.8 billion. Orders were estimated to fall 0.6% after the 0.7% increase in June. On a year over year basis, new orders are still up 8.3%. Breaking this down, durable goods saw a decline of 1.7% MoM; that large decline follows a 0.9% increase the month before. While not as strong as the previous period, nondurable goods orders rose by 0.2%. These readings are inline with the preliminary release. Within durable goods, the computers and electronic products industry saw the greatest gain of 0.9% MoM growth in new orders. Machinery was not far behind at +0.8% MoM. These gains were largely helped by mining, oil field, and gas field machinery which increased 13.7% MoM amidst rapid investment in new shale capacity. The transportation equipment industry dragged down all industries in July. Factory orders excluding transportation equipment were up 0.2% MoM. The volatile transportation equipment industry was down 5.2%, with the largest contributors to this change being nondefense and defense aircraft and parts, which saw 35.4% and 34.4% decreases, respectively. Interestingly though, with the past two periods showing strong gains, defense aircraft orders are actually down 5% YoY versus nondefense aircraft being up 14.1% YoY. The drop in new orders for these two industries completely overshadowed strength in the ships and boats industry which gained 25%. Shipments were basically unchanged from June to July, up only $0.1 billion, but still up 7.5% YoY. Just like new orders, when the transportation equipment industry is excluded, there was an increase of 0.6% MoM from June to July. While not as drastic as the change in orders, durable goods shipments are down 0.2% MoM. Nondurable shipments are also up 0.2% MoM, mirroring nondurable orders. Inventories for all manufacturing industry groups grew by 0.8% MoM, down from the 0.2% reading for June. On a year-over-year basis, they are up 5.6%. Once again, nondefense aircraft was a major factor with a 6.7% MoM increase. 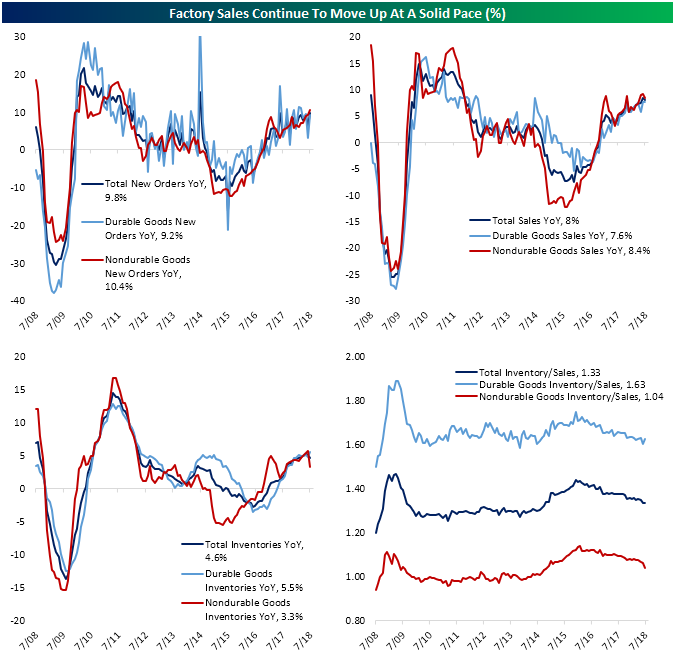 All manufacturing industries inventories to sales ratio has been relatively flat the past few months. The current ratio sits at 1.35, up 0.1 from June. Nondurable goods remained at the 1.07 level, while durable goods saw a 0.03 increase to 1.63, the same as its May and April number. It is worth noting that both shipments and inventories readings do feed through to GDP calculations by the BEA. Since there were no huge surprises, they should not have a strong impact on Q3 tracking.